After Dr. Karreman finished his presentation, Fay Benson, Project Manager NY Organic Dairy Initiative, Cornell University, introduced the subject of feeding barley fodder (sprouts) to organic dairy cows and John Stoltzfus, Be-A-Blessing Organic Dairy near Whitesville, NY, who explained how he grows barley fodder for his milking herd. Fay said that grazing dairy farmers have long noticed the health benefits of turning cows out to spring grass. Some even call it “Dr. Green.” The reasons for these health benefits are complex but is largely due to the function of the rumen on living plant material. Feeding barley fodder or sprouts is another way to get living plant material into the rumen, even in the winter. Barley fodder can have the nutrient density of grains without the detrimental aspects of starch. With this introduction to the use of barley fodder as a substitute for grain in a dairy cow feed ration, Fay turned over the presentation to John. John Stoltzfus has worked over the past few years to perfect his method of growing barley fodder on his New York farm. 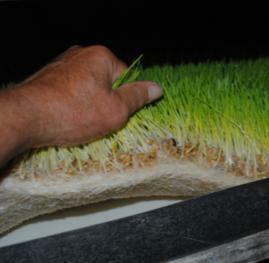 He has also used triticale to grow fodder for his cows. It is less expensive than barley when buying from a certified organic production source. Since he began feeding sprouted barley, John has eliminated the grain ration from his 40-head herd’s diet. Barley sprouts the quickest, but others will work. Hydroponic grown barley sprouts are high in protein and fiber, and are naturally balanced in protein, fat and energy. Compared to corn, barley fodder has 95% of the energy and higher digestibility. Barley fodder is one of the most nutritious sprouts being full of essential nutrients, vitamins, and minerals. Feeding barley fodder improves the overall health and wellbeing of the cows, and they eagerly eat it. It is very succulent being 88% water. Crude protein content runs around 12% of dry matter (DM), ADF is 19% DM, and NDF is 35% DM, NEL is 0.88 Mcal/pound, and NFC at 46% DM. Designing a barley sprouting unit for your farm requires answering two basic questions. DECISION 1: How many pounds barley fodder to be fed per cow? 5 lbs. - 30 lbs. @ 12% DM is the common range. A Washington State study shows more than 30 lbs. loses efficiency. One pound of dry seed makes 6-7 lbs wet fodder, provided that germination is above average. DECISION 2: How much space? For this example, we will feed 6-7 lbs. wet fodder per cow. This will require one lb. of seed/cow/day. One lb. of seed requires one sq/ft of fodder pan. Choose length of growing time. Rules of thumb are 6 days for increased energy, or 7 days for increased protein. Determine number of fodder pans required by multiplying number of cows to be fed times 1sq/ft times 7 days = sq/ft of fodder pans. Example: 50 Cows X 1 sq/ft X 7 days = 350 sq/ft of fodder pans. The sprouting room’s air must be managed. Their unit maintains the air temperature at 70 degrees. Humidity is harder to control due to changes in outside air humidity. Good air flow in the room and irrigation water temperature are also important. They are experimenting with pressurizing the room. Lighting is needed. 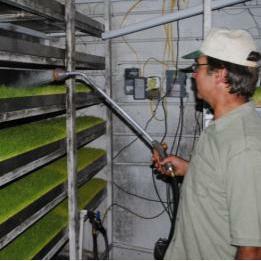 Fluorescent lights are used to provide light energy for the barley sprouts. It is not essential to use grow lights. They are much more expensive than regular fluorescent lights. Currently, at Be-A Blessing they feed 14 lbs. of fodder/cow/day. This requires 2 lbs. of dry seed be started per day. At \$500/ton, the seed costs \$0.25/lb. Seed Cost: \$0.50/cow/day. It requires spending one and a half hours/day to harvest, refill soak tubs and pans, and clean-up.